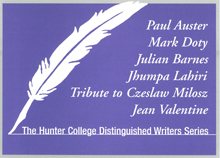 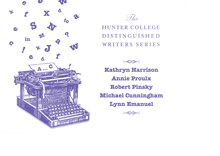 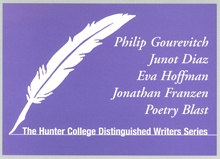 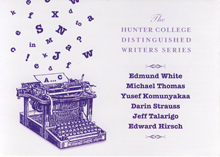 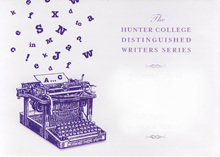 The wonderful thing about studying in the red hot center of the literary world is that everybody lives here, or visits here; and it is astonishing how many of these distinguished writers have a soft spot for Hunter College. So don't be surprised if Salman Rushdie or Michael Ondaatje turn up in class (they have already) or if Sharon Olds or Anne Carson come to read and talk to you, or you find yourself high above Manhattan, at dinner in the President's dining room, and there is Toni Morrison, just across the table. Great writers are often great teachers, and you'll come across many of them when they read at our celebrated Distinguished Writers Series or walk into your classroom and take their seat at the table. In the list above, all writers gave readings of their work. *Marks writers that also led an MFA craft class or workshop. From Fall 2008, all visiting writers have led an MFA craft class or workshop.